Kicking off the month-long general elections, Indian voters started casting their ballots on Monday morning in two northeastern Indian states of Assam and Tripura in the first of the nine-phase polling over six weeks. 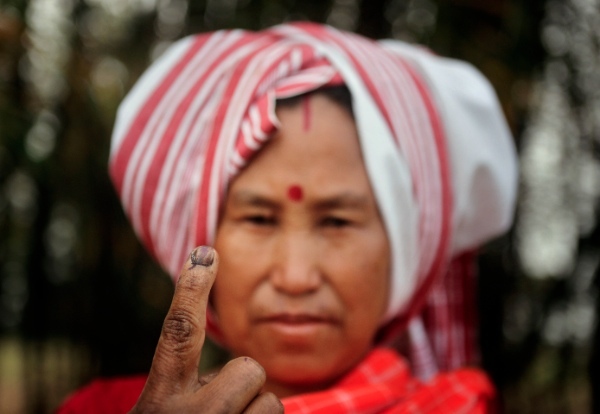 Voting started at 7 am (local time) in six constituencies — five in Assam and one in Tripura. Over 7.6 million Indians will vote today that flags off the first phase of India’s national election. The Indian elections this summer, the world’s largest electoral exercise, will be held over 9 days; and counting for all polls will be held on May 16. Many opinions polls ahead of the elections predict a victory for the right-wing nationalist Hindu party the Bharatiya Janata Party and its allies, although it is expected to fall short of reaching the halfway mark of 272 in 543 parliamentary constituencies. The Indian Election Commission has said that 814 million voters will be eligible to cast their ballots this year. “The greatest exercise in the democratic world set to begin. Another reason to love India! Let elections 2014 roll!” said senior Indian journalist Rajdeep Sardesai. Meanwhile, food and trade policy analyst Devinder Sharma referred to media coverage of the election season in the world’s largest democracy. “India’s TV intellectuals have always underestimated the political sagacity of the masses. People vote by what they think is best for them,” said Sharma. India’s BRICS peers Brazil and South Africa are also set to hold elections in October and May respectively. “SA wishes our friends well in India as they go to the polls…Voting is underway in parliamentary elections,” tweeted Clayson Monyela, the South African Foreign Ministry spokesperson.